WHY do we work by referral? Referrals are one of the main sources of business when it comes to Real Estate. It is great to be able to service the needs of our client's friends and family, especially after we had such a great transaction with them! We LOVE to work with referrals. We have made a commitment to work by referral to provide our clients with the BEST service whenever we are needed. A long-term relationship is so important to us, we want to be able to knock your socks off with what we can do more than just once! These are a few ways that we can serve you. When you need to be referred to capable service and trade professionals that are trusted like local lenders, legal professionals, pool service companies, roofers, contractors and so much more, just give us a call. We would be happy to give you a list of local vendors that our clients have used and that are recommended in the Real Estate Community. We can give you up to date information about the Market! It is every changing so dont hesitate to ask, it is part of what we love to do; staying on top of the key trends and local market statistics. Would you like to know what your home is worth? Would you like to know if those upgrades you want to do will bring true value? We would love to be your trusted advisor. As our client, we want to make sure you know how much you and your business mean to us. Our primary source of new business is referrals from people who already know and respect the great work that we do. And we are always delighted to build our business by working with such wonderful people like you! Our goal is to impress you SO MUCH that you run to family and friends and tell them about the great experience you had with us. We want to be refreshing, knowledgeable and caring. Do you have a Plan for Disasters? More than 80% of Americans live in counties that have experienced a weather-related disaster.1 However, only 39% of Americans have created an emergency plan for their households.1 While it's almost impossible to predict when an emergency or natural disaster will occur, creating a plan may help keep your family safe in the event of one. The better prepared you are, the more comfortable you will be if you have to put your plan into action. No matter where you live, your region may be susceptible to one or more emergency situations or weather hazards, including: earthquakes, wildfires, fooding, tornadoes, hurricanes or blizzards. Although some of these events - like hurricanes - may provide some advanced warning, other - like earthquakes - are hard to predict. Most of these occurances may lead to extend power outages; however, if you live in an area where they are likely, having a plan will help you prepare for the next event. Other emergencies can happen at any time, such as a house or building fire. Common causes include faulty appliances, electrical components and smoking. In fact, cooking equipment was the cause of 45% of home structure fires from 2009-2013. Emergency situations are chaotic. In the midst of the confusion, it can be difficult to get in touch with loved ones. Decide on a meeting place with your family ahead of time to reduce some of the initial stress. Choose three locations: one in the neighborhood, one in your town and one out-of-town, and make sure everyone knows how to get there. Your safe area may vary depending on the emergency - for example, in the event of a tornado or hurricane, stay away from windows and take cover in an interior room of your home or building, on the lowest floor. Make a plan that outlines all the information you'll need to know in the event of an emergency. Not only will it help you get to a safe location, it'll also allow you to let your loved ones know you're safe. If you're home when an emergency occurs, you may have to evacuate with little to no notice. Select several safe evacuation routes, and make sure everyone is familiar with them. Have someone turn off the utilities, like water and electricity, while another person packs the important documents and another grabs pets. Giving everyone a responsibility will ensure nothing important is left behind. Check out the PDF link below for MANY ideas on how to prepare for any emergency, including how to plan for your Pet! Visit www.ready.gov/make-a-plan to download an emergency plan template you can tailor to your family's needs! You May Miss Out on Low Interest Rates! In December, the Federal Reserve raised the key interest rate by a quarter-point to a range of 0.25% to 0.5%, the first rate increase in nearly a decade.1 While some experts expect the Fed to raise rates gradually this year, some economists expect rates to increase three or four more times this year.2 Increases are anticipated to amount to a quarter -point each time, and when they do occur are sure to impact mortgage rates.2 What's a homebuyer to do? Quarter-point interest rate increases may not seem like a whole lot but it could mean the difference of hundreds of dollars! Check out the image below or upload our PDF for more details on these bullet points and to gather more important information on why NOW is the time to buy! Sure, buying a home is very exciting but there is a lot more than just home tours and paperwork! Your Agent is working tirelessly behind the scenes, day and night, week and weekend to make sure you are getting a great home, for a great price and checking off as much as they can on your "Must Have" list. Here are a few things that YOU as the Buyer can do to help make your Agent's job a bit easier. 1. Try not to get too caught up in aesthetics. Many items that may bother you as the Buyer are easily fixed! Don't sweat the small stuff, remember that your Agent can always negotiate repairs and the price of the home but most of the things that you want done, can be done in a weekend! Try to look at it in a more positive way, "yes, there are a few things that I would like to have done BUT this home is in the perfect neighborhood and for a great price!" Sometimes separating "wants" from "needs" helps. 2. Being too focused on the money can hurt your experience. Of course money is a very important part of the buying process, we get that but exhausting all of your thoughts on the financial aspect will hinder your ability to focus on anything else. The Seller doesn't always accept the highest offer, most often they will accept the best offer which is a combination of price and terms. Sometimes a Buyer's financial qualifications come into the decision making process as well, for example; cash buyer versus FHA buyer. You really need to trust your Agent when it comes to structuring a good offer that combines the right mix of timing, price and reasonable contingencies. 3. Don't sit on it too long! If you're in love with it, you haven't found anything like it, you can't live without it, MAKE AN OFFER. In this market it is VERY important to make an offer if you find the "right one". Houses don't sit long and before you know it the house you fell in love with has been sold to someone else! Not fun. 4. Talking to the Listing Agent...probably not a good idea! The Selling Agent is there to get the most money for the SELLER not the BUYER. For example when calling a Listing Agent on a property, a buyer many sometimes share details about their situation, scenario, possible relocation and financial qualifications that the Listing Agent is duty bound to share with their client who is the Seller. This places the Buyer in a disadvantageous negotiating position. It's best to leave this communication to your Buyer's Agent, they've got this! 5. Low-balling offers is a no no! Take this for instance: The seller declines the first offer and the buyer then makes another unreasonable offer. This is going to frustrate the Seller, cost the Buyer the house and tie up the Buyer Agent's time on a home in which the offer will be refused. Please listen carefully to your Agent, they know best what Sellers likely will and won't accept. After all, you hired them for a reason, they are pretty good at their job! 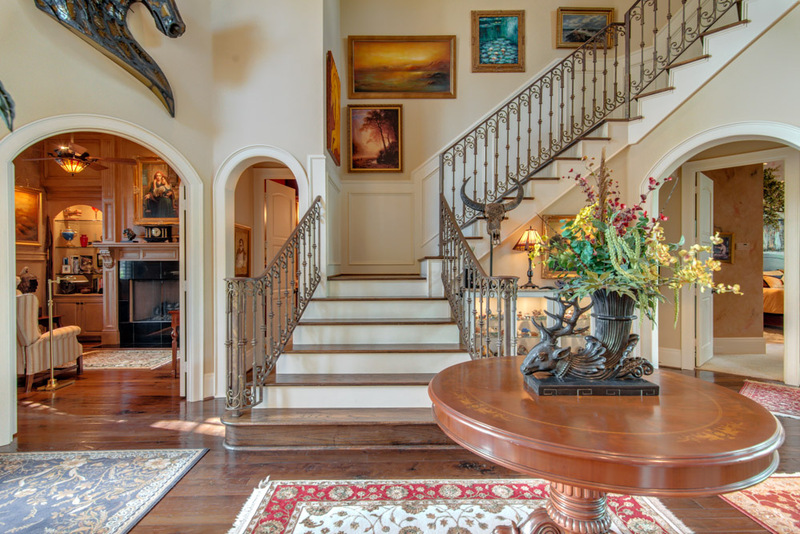 Texas broke Real Estate records last year! They say everything is bigger in Texas, Real Estate is no exception...In fact, statewide home sales and prices reached an all-time high last year according to the latest Texas Quarterly Housing Reports released 2/1/2016 by the Texas Association on REALTORS®. For the first time in history annual home sales exceeded 300,000, with more than 309,000 Texas homes sold in 2015! "Texas has enjoyed four straight years of booming real estate growth and record-high housing demand," said Texas Association of REALTORS® Chairman Leslie Rouda Smith. Check out this info-graphic with statewide data, and download the full report to see data for 25 markets across Texas. It's Time to File for Your Homestead Exemption! 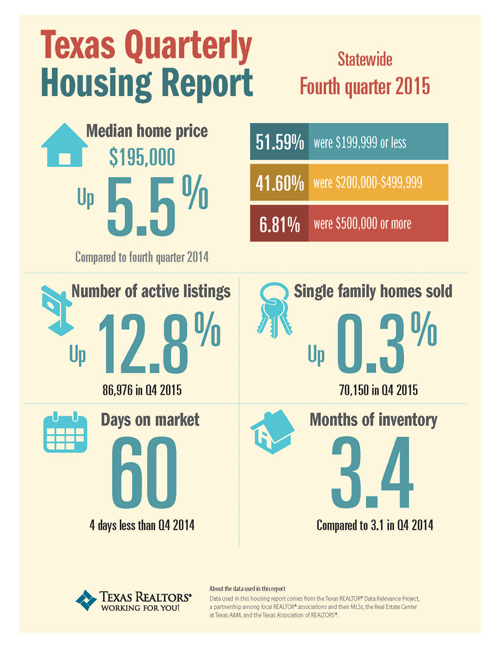 Good morning to all, I have some great news for those of you who purchased a home in 2015! You are now eligible for a Homestead Exemption. Basically a Homestead Exemption helps you save on taxes on your home. An exemption removes part of the value of your property from taxation and lowers your taxes. For example, if your home is valued at $100,000 and you qualify for a $20,000 exemption, you pay taxes on your home as if it was worth only $80,000. What Kinds of Homestead Exemptions Are Available for Harris County? § School taxes — all homeowners. If you qualify for the homestead exemption, you will receive at least a $15,000 homestead exemption on the value of your home for school district taxes. § County taxes — all homeowners. Harris County currently provides a 20% optional homestead exemption to all homeowners. This means, for example, that if your home is valued at $100,000, the exemption will reduce its taxable value for Harris County taxes by $20,000 to $80,000. § Optional exemptions — all homeowners. Any taxing unit, including a school district, city, county or special district, may offer an exemption for up to 20% of your home’s value. The amount of an optional exemption can’t be less than $5,000, no matter what the percentage is. For example, if your home is valued at $20,000 and your city offers a 20% optional exemption, your exemption is $5,000, even though 20% of $20,000 is just $4,000.The governing body of each taxing unit decides whether it will offer the exemption and at what percentage. This percentage exemption is added to any other homestead exemption for which the applicant qualifies. For a general exemption: up to one year after the date taxes became delinquent for the year (usually February 1 of the year following the tax year). 1. If you are already qualified and you purchase a different home, you have one year from the date you occupy the new home to apply. 2. If you turn 65 during the year, you have until your 66th birthday to apply for the year in which you turn 65. 3. If you become disabled during the year, you have one year from the date you became disabled to apply. Otherwise, the deadline for applying for the over-65 or disability exemption is the same as the deadline given above. If you have purchased in Montgomery County, please visit click this link to MCAD, for further information on available Exemptions and Deadlines. You can also call our Christina Terry at our office, 281-348-3081, for more information!